Tomato vines… what to do? I have a Rubbermaid compost bin where I dump my kitchen scraps, and a nifty three-bin pallet compost bin for larger stuff, as well as wire cages where I’ve heaped tough weeds and vines. My wire bins floweth over. 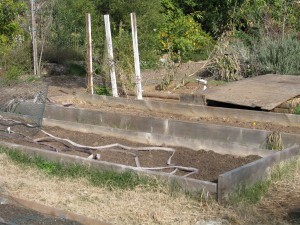 All of these methods of composting are great. They also require some physical work that I’m wary of these days. I still keep my old raised veggie beds lined with chicken wire and use them for controlled or experimental crops and extra seed. The soil in them settles after awhile and because I don’t turn my compost heaps enough I don’t produce enough compost to haul over and refill the beds. 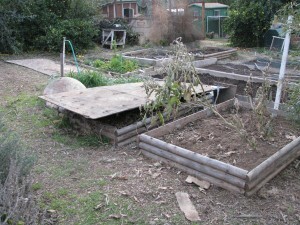 Soil is at a low level in the raised beds. Today I decided to try mini hugelkultur beds. Hugelkultur is the practice of heaping wood and other organic matter, covering it with soil and planting directly on the pile. The berm catches water and the buried wood holds the moisture, releasing it slowly to the plants and gradually decomposing to create beautiful soil. When I planted my strawberry bed two years ago I buried old lime tree logs all along the edge. Now that soil is beautiful as the logs decompose, helping to acidify the soil for the acid-loving strawberries, and holding moisture by the roots. 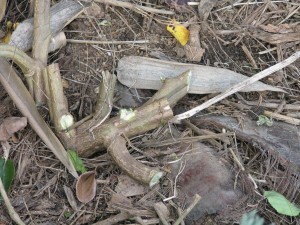 Some strawberry plants have rooted right in the logs. 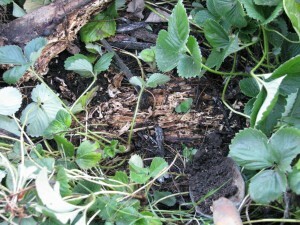 Strawberries have rooted runners directly into the rotting lime logs. The soil around the logs is perfect. In one of my long raised veggie beds I cleaned out the frosted tomato vines and what sweet potato vines were left after our harvest. Frosted tomato vines: treasure, not trash! I don’t like to disturb the soil because that kills microbes, fungus and worms, but this soil hadn’t been perfect to begin with. 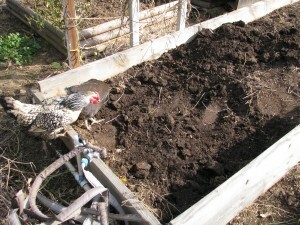 Digging up the soil and trying to protect the worms from the persistant chickens. 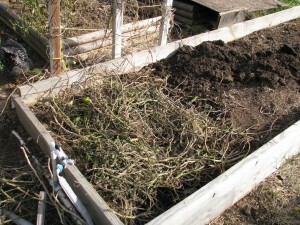 I shoveled out a portion of the soil then cut up the tomato vines and dropped them in the bed. 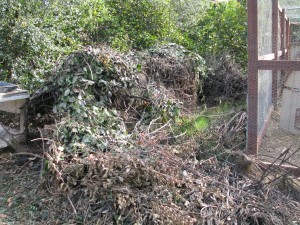 Then I shovelled the dirt back over again, and made my way down the bed until all the vines had been covered. A few vine ends stick up, but that’s okay. If I had more soil I’d bury them more. I also sprinkled on sugar and epsom salts, to feed the microbes and add magnesium (I’ll blog about these two garden wonders another time). 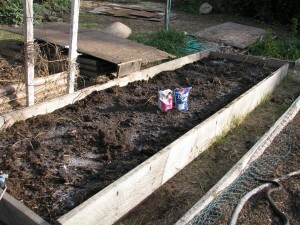 Magnesium-rich epsom salts and sugar (organic molassas is better) invigorate the soil. Burying garden leftovers like this does several things. It quickly feeds the microbes and worms in the soil without the critters having to gnaw on them from underneath or wait until the plants decompose more. The vines keep the soil from compacting and help hold moisture when it rains. 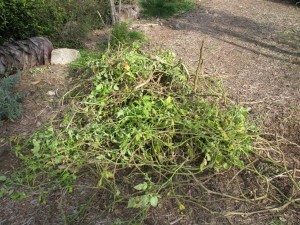 I cut the tomato vines and leave the stem and roots. Worms love roots. 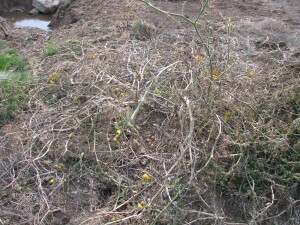 The vines had taken nutrients up into the leaves and fruit, and now many of those same nutrients are being returned to the bed in which they grew. Keeping the soil moist from underneath is a valuable way to protect seedlings from bugs. 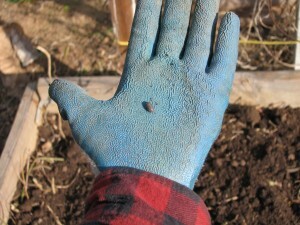 Top mulch I have found to be a nursery for damaging pill bugs, which you might call ‘rolly-pollies’ or sow bugs. A sow bug on my glove (No, I’m not a Smurf). Although experts say that sow bugs don’t directly damage plants and fruit but rather feed off of already damaged produce, I have my doubts. If so, I believe that mine hired another bug or bird to damage about half of my strawberry crop last year so that they could feast on them. Because decomposing green matter will initially take nitrogen from the soil, I’ll let this bed sit for a couple of months before planting, or if I can’t stand to wait I’ll plant nitrogen-fixing peas as a cover crop. I won’t repeat the same crops in this bed because it is smart to rotate families of veggies for many reasons, including pest control. Whatever I put in here, however, will be a mix of seeds. 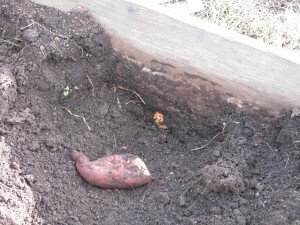 I spy a sweet potato that hid the harvest by growing under through the wire and under the board! 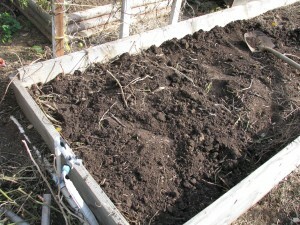 Another bed I’ve been playing with had been empty and needed soil. Over the last season I’ve thrown in garden debris and a layer of llama poo topped with sweet potato vines. Last week I balanced a piece of plywood over it. Today I took a peek and the vines are covered with bugs decomposing in the moist darkness of the plywood as the heap gradually settles. I’ll leave it be and keep checking on its progress. I have more lazy composting ideas for the entire property. I’ll let you know. This entry was posted in Compost, Gardening adventures, Hugelkultur, Permaculture and Edible Forest Gardening Adventures, Soil, Vegetables, Worms and tagged Compost, Edible Forest Gardens, Gardening, Hugelkultur, Permaculture, Raised beds, Soil, Vegetables. Bookmark the permalink.